The next time when you visit an ATM of your bank to swipe your debit or credit card make sure the ATM door or the ATM machine does not have any suspicious device attached to it. 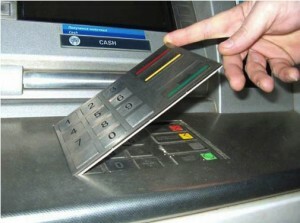 Cyber criminals fix various kinds of skimmers on ATM doors or ATM machine itself to record your card data. The data of cards thus collected is later used to create fake credit cards. Just seven days ago a man was held in Pune for making purchases at a mall using fake credit card. The card was swiped successfully but had some mistake in logo printed on the card which was observed by the alert cashier. More fake credit cards were recovered from the person (Full news here). 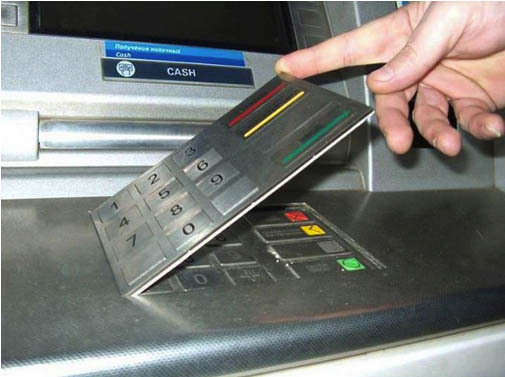 Since ATM card skimmers are easy to create or are easily available and the latest technologies like 3D printers and magnetic readers can help these cyber crooks to create a skimmer more easily more and more of such crimes are taking place. Card skimmer is a device that is fitted on the ATM machine just above the card entering slot or sometimes at the entrance door. This device captures card data when a card is swiped through it. Along with this there can be a miniature camera somewhere above the keyboard for recording the PIN. Sometimes instead of camera a fake thin keyboard skimmer is attached over an ATM original keyboard that records the PIN as you type. If you Google for “images of ATM skimmer” you will get several snapshots of how different card skimmers look and how to identify them. We advise all our users to beware when using ATM and keep checking any presence of skimmers. 1. 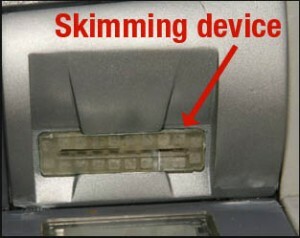 To check if there is any skimmer attached, look for any signs of tampering to ATM card reader. 2. Check for some attachment or extra device/wiring that does not look as a part of original ATM machine. 3. Check for any key pad overlays or extra layer of keys on the key pad. 4. Always use your other hand as a cover while typing the PIN. 5. Do not use too many different ATMs and always go to an ATM that is situated in a crowded place. 6. Have your mobile phone number associated with your credit/debit card for SMS alerts. 7. Regularly check your bank balance. Nice article, my question is, how can anybody implement skimmer device to ATM’s which generally are secured? What precautions bank taking to avoid this? What to do if i became victim of this skimming? This information is already shared with banks. Skimmers are usually added to ATMs which are not guarded properly and can be tampered. If you become victim of skimming you need to do two things first, contact the bank and inform them and get the card blocked and contact the nearest police station to report the crime. Do you think ATM complaint FIR is so easy to get from Police? I am struggling from last 10 months with all Supreme Court Guidelines to get FIR. I think I will have to knock door of HC or SC to get FIR. This is in connection of cheating for millions of Rupees and second party also spends money for not giving FIR or disposing case without FIR. Finally their reputation at stake. Any way you have given a new feed to my brain work. When criminals are so upto date with their technology why dont banks also be one step ahead, to protect customers. When skimmers and other gadgets are installed by criminals in the ATM, there should be an alarm which is set off. What is the use of the convenience of ATMs when there is so much risk involved. Thank you Sir,for making us aware about the eye-opening skimmers leading to data theft. Sir,Could you please let me know Why shall we prefer always go to an ATM that is situated in a crowded place?Any specific hightech logic. Criminals will not get time to install skimmers at an ATM that is situated in a crowded place, I think. ATM’s situated in a crowed place are used frequently and there is less possibility to attach any skimmers. Always prefer an ATM which is located in the bank premises or near to Bank or an ATM with a security guard around. thnx sir……….. that’s a useful information ……..
Thanks……….This is very useful information………. Thanks you sir, for your guidance. Banks must check regularity such Skimmers activity or any kind of tampering at ATM machines to avoid any financial loss to their customers. For normal people it will be difficult to find out like this or other kind of device fitted /attached to ATM. Your information is an eye opener. Thank you very much. I trust quick heal my lappy and PC are secured by Quick heal Thanks for updating us on this skimmer attack . Is there any way to get My WEBSITE:Jobschilly Secured by Quick Heal ? thanks so much for posting stuff liek this. very useful for people like me who use atms quite mindlessly. Thanks for the information. I would also like to share that it is unusual for any ATM to come to start point after usage. This is happening outside Malls and other areas of less usage but more drawers. please put some light on our observance. secondly whenever another bank’s card is used in ATM the lead is direct without any verification and moreover the disbursement is fast than in LOYALTY ATM’s. Thank you for sharing your observation. We have taken a note of your suggestions. Thanks for the informative advice. Trust many more people will adhere to this in future. Very interesting & useful information. Till date I don’t know about such skimmer. Please also write about skimmer at Petrol Pump and in Hotels. Lot of such things happen at petrol pump. Many thanks to upgrade our knowledge. i think such technical precautions should taken place at manufacturing level of ATM machines. The company that manufactures ATM’s should regularly test or Analyze the machines towards prevention of such Fraudulent / skimming activities & they must provide such technical testing of ATM’s at regular intervals. Dear sir thanks for very-very most useful informations. A fabulous piece of information. Every reader of it should be grateful to the QH team. Why to use an ATM that is situated in a crowded place? How it is more secure? Thanks for writing the article to alert common person who does not know the technicalities about ATM (Card, Machine & sometimes even the proper operation). Thnx for the Information (Very Useful).